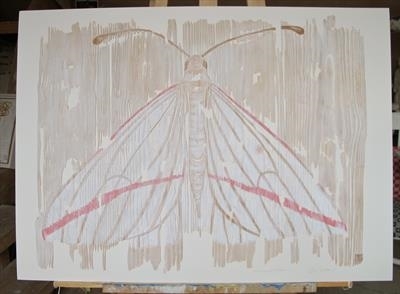 A pale pink and white moth dyed with pigment on fine grainy wood, framed and wall mounted. Fragile and delicate similar to the moth's wings, the wood is sanded finely till it frays at the sides and becomes papery. Created in Jilly Sutton's studio in Devon.